Blueberry Cheesecake Ice Cream is creamy, rich and studded with fresh blueberries and graham crackers. 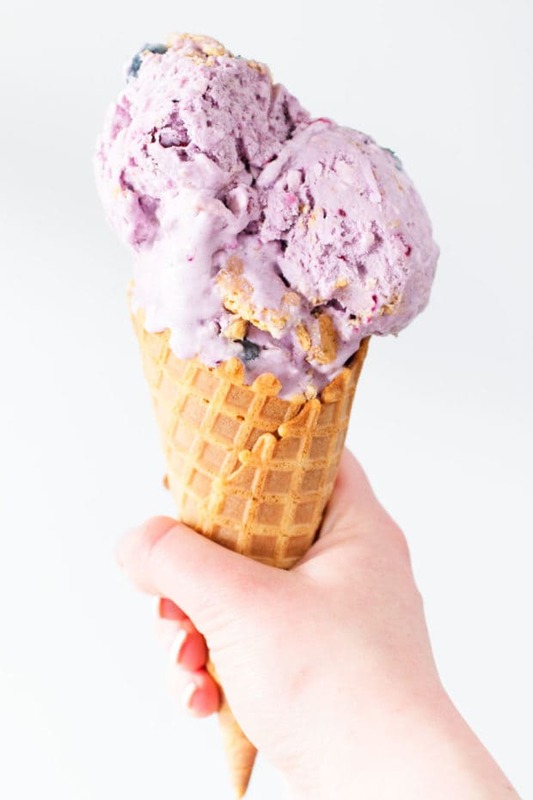 You won’t be able to stop at just one cone to cool off with this summer! I’m back to making ice cream again… You know what that means – Meghan is trying to relieve stress! 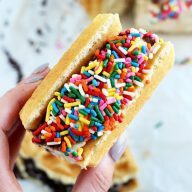 Making ice cream is just a soothing process for me, especially when it doesn’t actually involve too much cooking like this recipe right here. 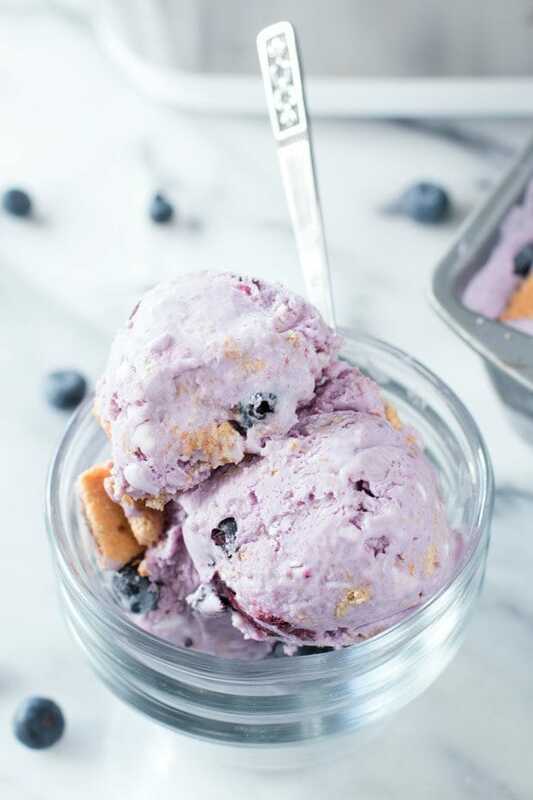 I had a blueberry cheesecake ice cream a couple of summer ago at Sweet Action Ice Cream here in Denver, and I’ve been meaning to recreate it ever since. It’s just been sitting on my ever-expanding list of recipes, waiting to be made whenever I started to feel overwhelmed with life. Business has been booming recently and I’m starting to put my toe in the water of real estate, so I’m starting to have inner freakouts on a regular basis. There’s just so much that goes into running my own business and the work keeps pouring in, which puts me behind on all that fun administrative stuff that I really should do… UGH. It’s basically doing your taxes every few months with a bunch of little tasks in between. SUCH fun, right? Anyway, I felt the strong desire to make ice cream so I could get my mind right. I was skimming my list of ideas and there this bad boy was, just waiting for me to pick it. I’m so so so glad I did. 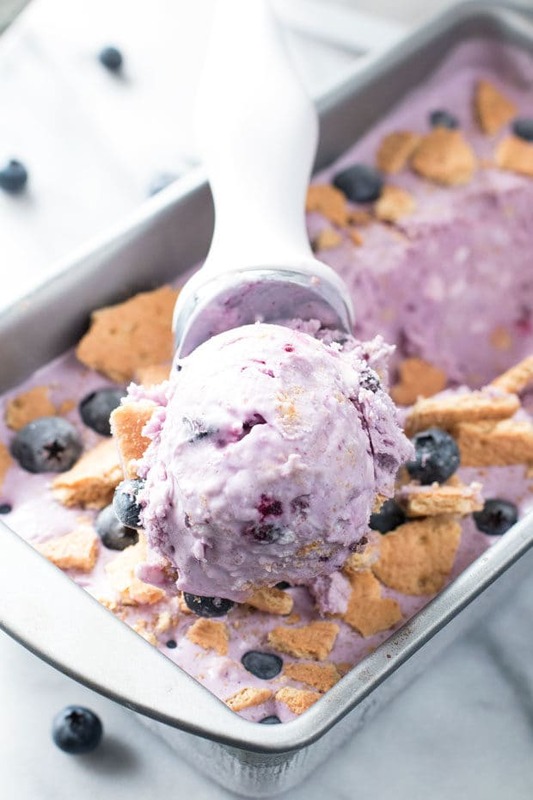 This blueberry cheesecake ice cream is the stuff summer ice cream dreams are made of. 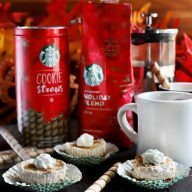 It’s creamy, rich, and fruity with just the right amount of crunch from those smashed up graham crackers hidden throughout. Plus you only have to cook the blueberry compote and don’t have to worry about making a custard at ALL. This recipe couldn’t be simpler, which can really be attributed to The Fruit Scoop Cuisinart sent me to review. Not only does it whip up amazing ice cream like *ahem* this recipe, it also does magical things with fresh fruit. You can make creamy raspberry sorbet or chunky pineapple sorbet or a rich creamy luscious ice cream. The Fruit Scoop makes ice cream and frozen fruit treats in less than 25 minutes (this recipe only took 15 minutes!) so it’s exactly what you need to cool off with this summer whether you’re watching your waistline or don’t give a crap about calories (that’d be this girl over here, obviously). I scream… you scream… Oh you know how it goes. Disclosure: This post is sponsored by the Cuisinart. 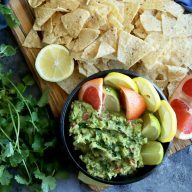 While I was compensated with product for this post, as always, all opinions and the recipe are my own. Thanks for supporting the brands that support Cake ‘n Knife! 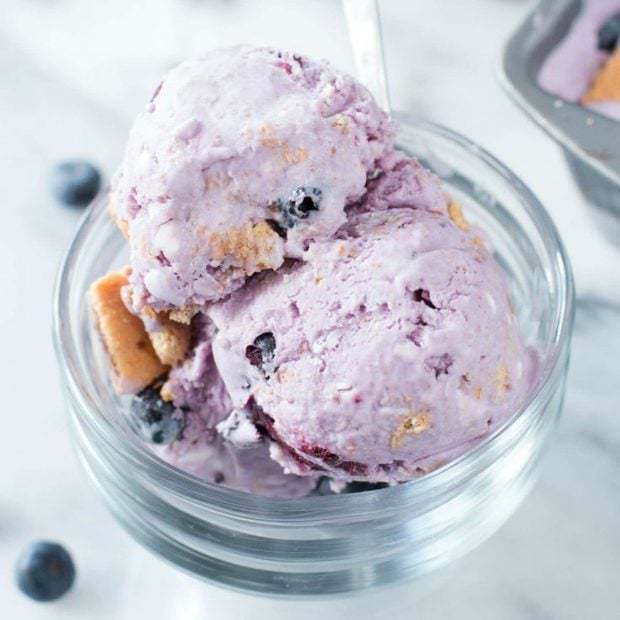 Smooth and creamy cream cheese ice cream is packed with a fresh blueberry compote and graham crackers to make it cheesecake bliss. In a medium saucepan over medium heat, combine blueberries, sugar, and lemon juice. Bring to a simmer and cook, stirring occasionally for 5 to 7 minutes, or until blueberries have burst and the mixture is thick. Remove from heave and cool completely, chilling in the fridge if needed to cool faster. Add cream cheese to the bowl of a stand mixer fitter with the paddle attachment. Cream the cheese lightly, until just turning creamy and smooth. Add in milk, cream, sugar and salt and continue to blend until smooth. 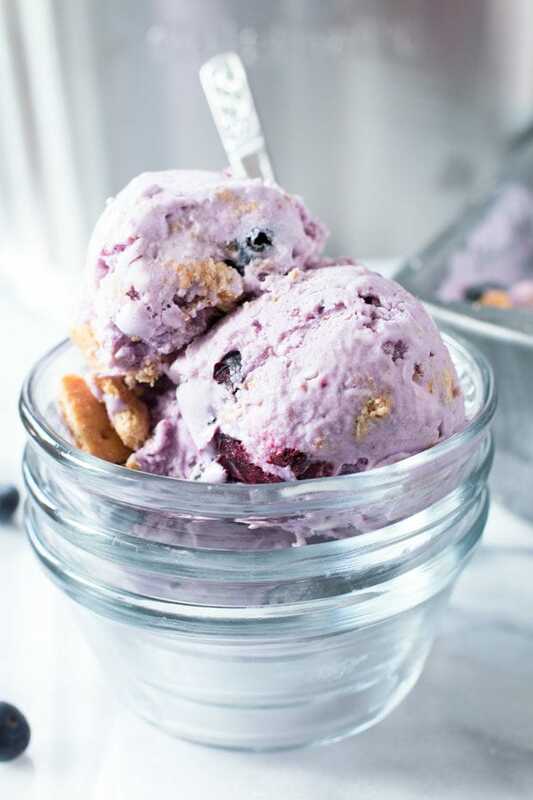 Add the cream cheese ice cream mixture to your ice cream maker and churn according to the manufacturer’s instructions. For the Cuisinart Fruit Scoop machine, churn for 15 minutes. 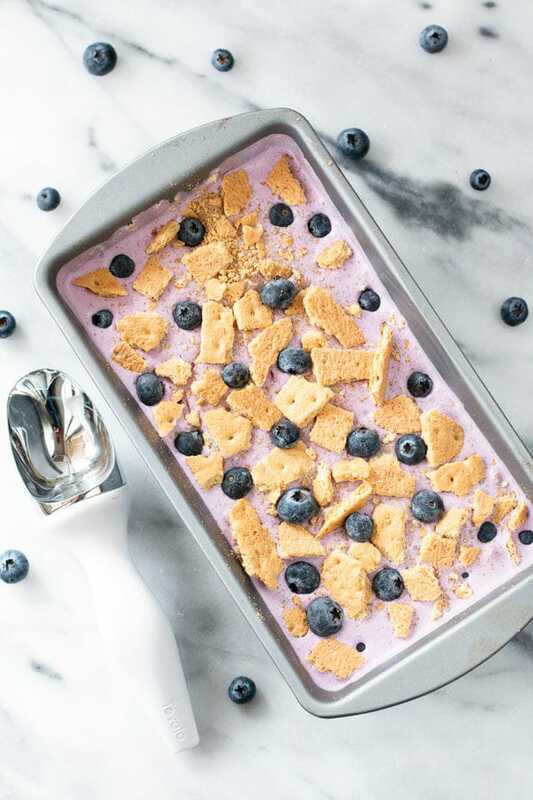 Spoon in the blueberry compote, add in the graham crackers, and churn for 1 additional minute. Pour the mixture into an airtight container and freeze overnight before serving. Old post, I know. Just wanted to say this was a-MAZING! Thanks for a great keeper. Thanks so much! I so appreciate it!